1. Cut a piece of Seasonal Kraft Resist 4 x 6 inches. Tear 1/4-inch off top and bottom edge. 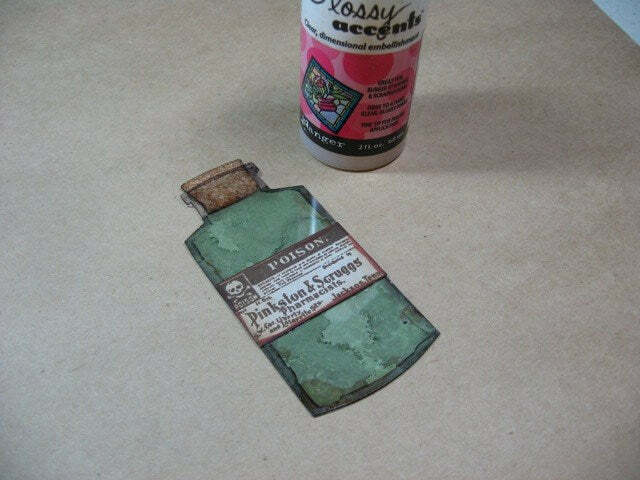 Working on the Non-Stick Craft Sheet, cover surface with Rusty Hinge Distress Stain. Let dry. 2. 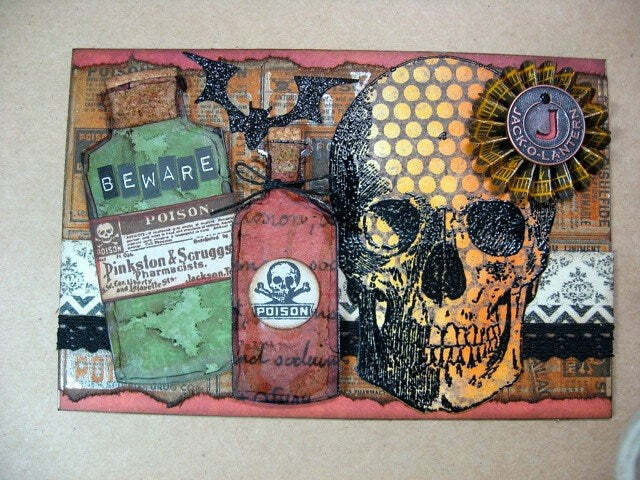 Stamp large skull onto Laboratorie paper with Embossing Ink. 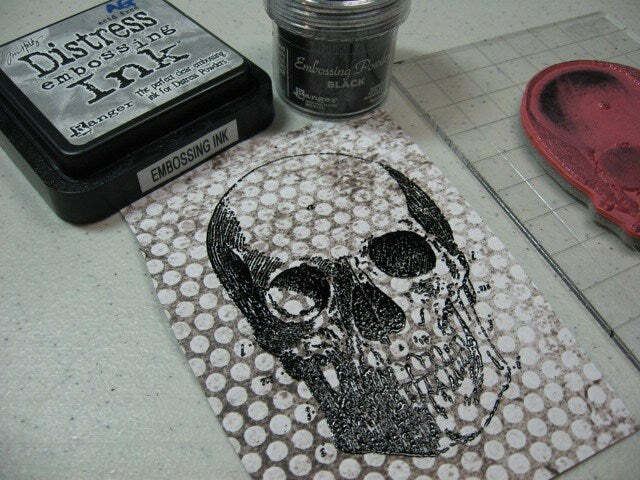 Add Black Embossing Powder and heat until shiny. 3. 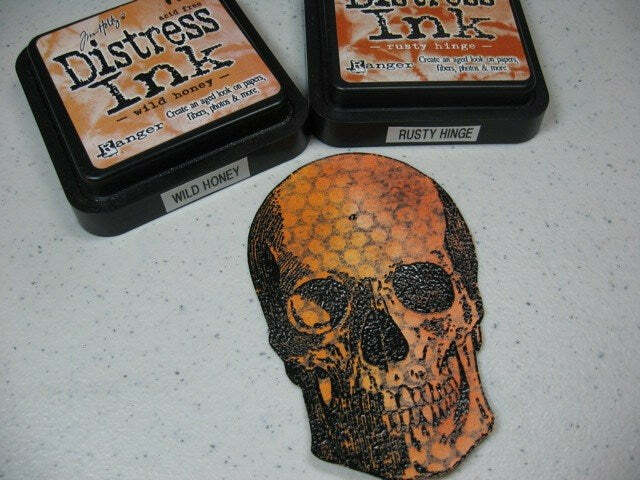 Ink over the skull using a blending tool with foam and Wild Honey Distress Ink to left side of face, then Rusty Hinge on the right. 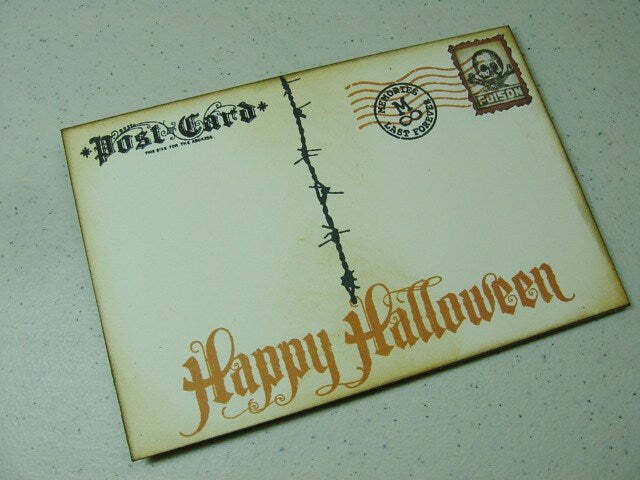 Cut out stamped image. 5. 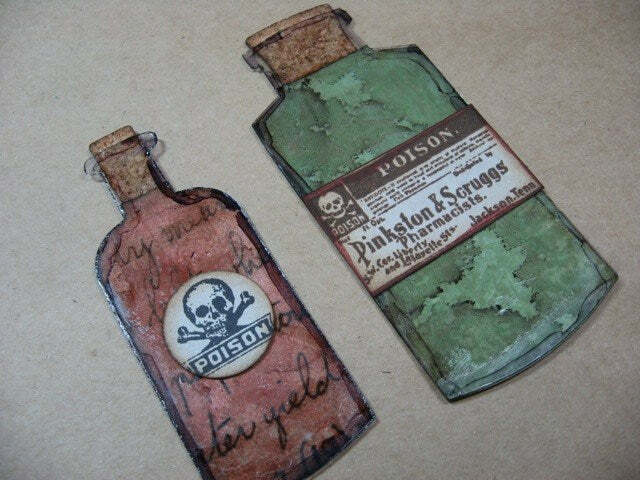 Cut two bottles out of both Shrink Plastic and Crowed Attic papers using the Apothecary Bottles Die. Ink edges of papers with Black Soot Distress Ink. 6. 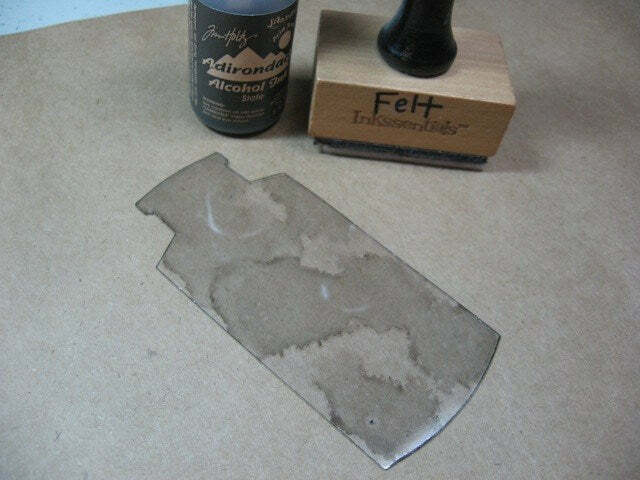 Using a felt pad on a blending tool, apply Slate Alcohol Ink in a pouncing fashion to one side of the Shrink Plastic. 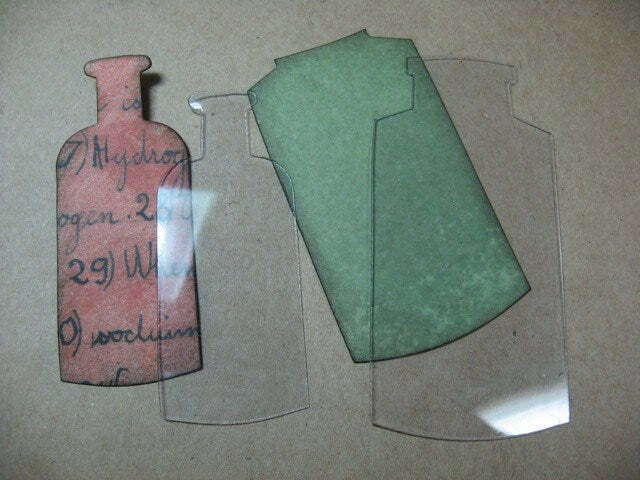 Do this to both Shrink Plastic bottles. 7. 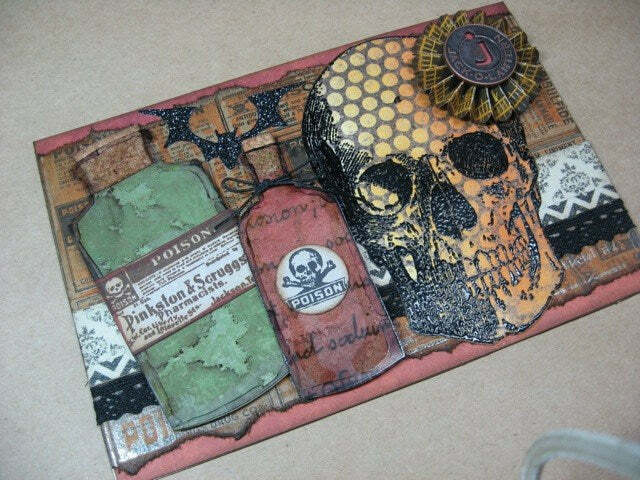 Using the Alcohol Ink Fillable Pen, pick up some Pitch Black Alcohol Ink from the Ink Palette. (Note: The ink was dispensed into the palette and left to dry. 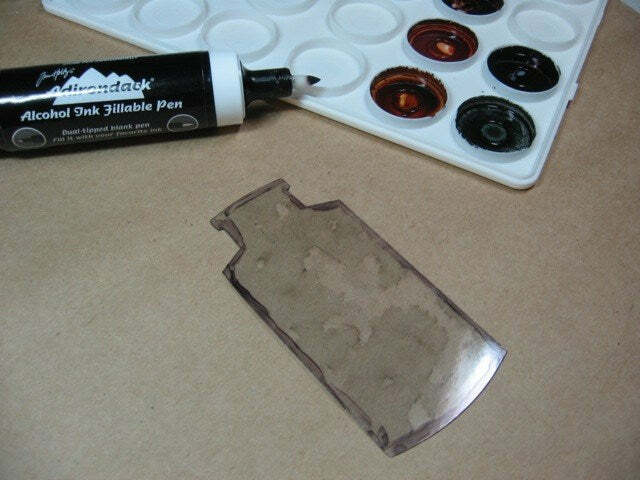 The Alcohol Pen is filled with Blending Solution and is used to lift the dried alcohol ink from the palette so it can be used like an alcohol marker.) 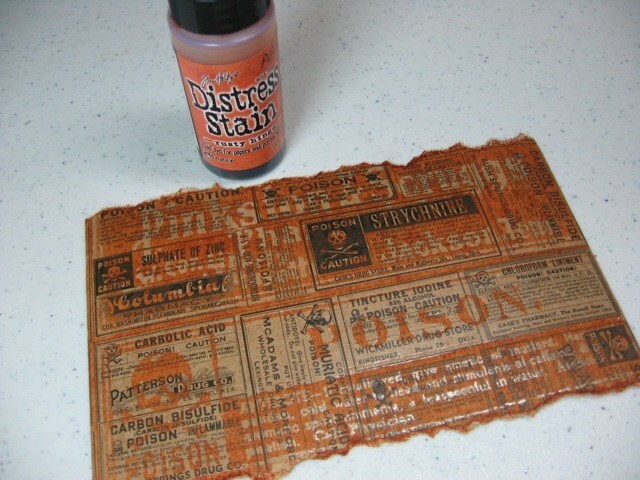 Color the outer edges of the Shrink Plastic bottles in a messy, distressed fashion. 9. Do the same with the second bottle. 10. Create a mini rosette with Laboratorie ruler paper, inking the top with Rusty Hinge Distress Ink. 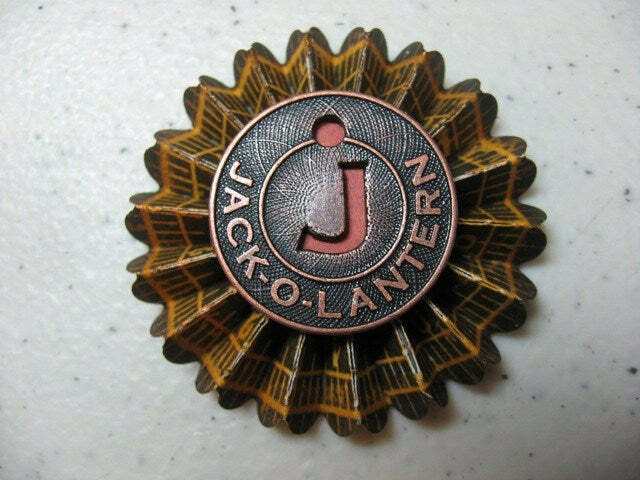 Add must token with a piece of orange cardstock behind the opening of the letter J. 11. Cut a bat from grungeboard. Apply Glossy accents to bat. 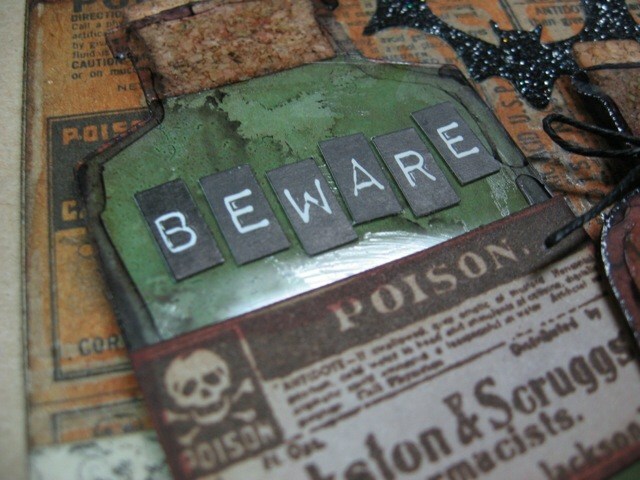 Pour Black Soot Distress Glitter over top and return excess glitter back into the jar. Let Dry. 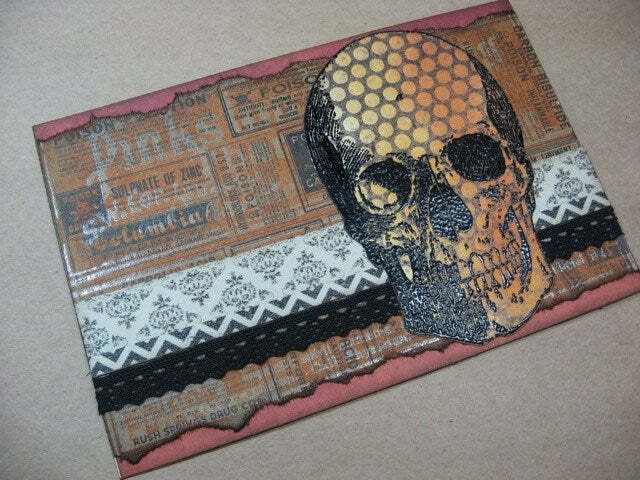 Then assemble elements onto postcard. Tie some waxed twine around small bottle’s neck and tie into a bow. 12. Add the letters BEWARE to large bottle. 14. Adhere cream cardstock to back of postcard and stamp as desired.